Alexis Bellino brought class, sass, and a pair of "Jesus Jugs" to The Real Housewives of Orange County when she joined the cast for the fifth season. The devout Christian appeared to live a charmed life beyond the walls of her massive mansion, alongside her three children, James, Melania, and Mackenna, but there was trouble brewing within her marriage to husband Jim Bellino. Fans of the series questioned many aspects of the conservative couple's relationship, and the pair was engulfed by rumors of deceit and financial difficulties, but just like any other relationship, the Bellinos appeared to be weathering the storm … up until the not-so-shocking June 2018 announcement that they would be divorcing. "It is with heavy hearts that we inform the public of our mutual decision to end our marriage — but it's important to us that you know we made this choice together, with love, and as the best decision for our children's future," their joint statement read, in part. TMZ reported Jim was the one who filed for divorce, and he asked for joint legal and physical custody of their kids, as well as spousal support. His fleet of exotic cars aren't going to pay for themselves! So what went wrong for this reality TV couple who appeared to have it all? Here's the real reason Alexis Bellino is divorcing her husband. The couple wed in April 2005 when Alexis was just 28 years old. Their 15-year age gap may not have caused any issues for them initially, but it appeared to drive a wedge between them as the years passed by. Following the news that they would be going their separate ways and driving off into the California sunset — in separate Ferraris, of course — the couple went silent on their respective social media accounts before jumping back into the limelight to give some insight on why they decided to split. "Our marriage was a good one, but we were never perfect people or spouses — no one is, and in this respect, we were a lot like millions of other married people," the statement read. "And, just like millions of other married people, we simply grew apart over time — there is no ill will or bad blood between us — and maybe that's why absurd rumors about our marriage and future together began when we filed for divorce." With such a big age difference, we're going to accept that they really did grow apart, and there was nothing salacious surrounding their desire to divorce … for now. Alexis Bellino famously battled it out on the small screen with her former castmate Tamra Judge, and long after Alexis got booted from the series after the eighth season, their row continued. 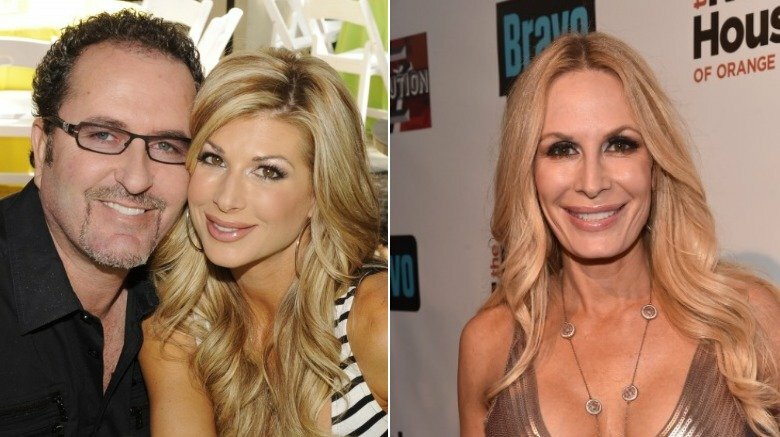 Surprisingly, as soon as news hit about Jim filing for divorce, Alexis found an unlikely ally in her former RHOC nemesis. Judge appeared on actress and comedienne Heather McDonald's podcast on June 26, 2018 (via Radar Online), and during the interview, she allegedly called Jim a "shady motherf****r" who is "going to jail." Shannon Beador, another cast member of the show who went through a public divorce, also heaped some dirt on Jim and Alexis, particularly their trampoline parks. Beador claimed customers were left paralyzed after visiting one of the Bellinos' businesses. Those harsh words definitely struck a nerve. The website reported Jim threatened to sue both Judge and Beador for defaming him and his business. If he is indeed as shady as Judge proclaimed, perhaps divorce was the best option for Alexis after all. The year 2010 was a rocky one for the now-estranged couple. Not only did Jim's real estate company, Global Marine, Inc., file for Chapter 11 bankruptcy, but the then-couple also reportedly narrowly escaped losing their Newport Beach, Calif. mansion to foreclosure. They wound up selling their home way below their $4,995,000 asking price, according to The Orange Couty Register. When news broke that they dumped their six-bedroom abode for a paltry $3 million, it raised a lot of eyebrows. In Touch Weekly (via TMZ) printed what we were all thinking when they ran a cover story with a photo of the former housewife and a caption that read, "Bankrupt! Evicted! Foreclosed! Housewives Are Going Broke." Yikes. Alexis decided to clap back. Not only did she deny the allegations, but her lawyer slammed the tabloid with a letter to cease and desist, too. Financial trouble can certainly cause a relatively happy marriage can go sour. We hope this wasn't the case for Alexis and Jim, but, where there's smoke, there's fire. Did her irrational fears lead to their split? Prior to getting hitched to Jim, Alexis was married to a man named Jeff Barry. That union ended in 2003, and it left such a funky taste in her mouth that she decided to visit a therapist during a "Lost Footage" segment of RHOC (via The Huffington Post). The baggage from that relationship was so heavy that it allegedly affected her marriage to Jim. "I probably freak out about divorce because of the fact that my parents got divorced … that's why Jim and I work so hard to keep our family unit number one, because you think, 'Oh the grass is greener on the other side … if I get out of this marriage, my kids will be better,'" she said during the segment. "But if the grass is greener, you need to water your own lawn, not buy another house." It sounds like a simple formula for marital bliss, but looking back on Alexis' own admission that divorce freaked her out, is it possible that her irrational thoughts brought her worst fear to fruition? 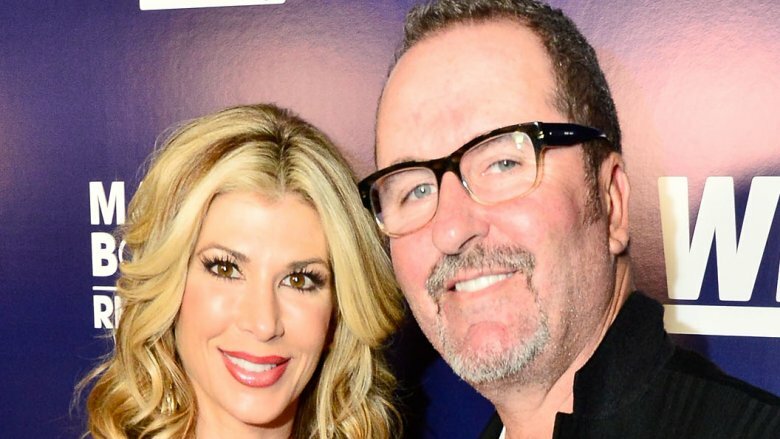 Alexis Bellino's good friend, Peggy Tanous, joined The Real Housewives cast in the show's sixth season, and it was revealed that she had had a fling with Jim before he married Alexis. "I wanted to respect her marriage, and he's the husband, and let him, if he wants to tell her, he can tell her," Tanous told Bravo TV's The Daily Dish. "But once we're both on this reality show, he was like, 'Oh, God, I've got to tell her.'" Instead of taking a Louisville Slugger to both headlights after finding out the truth, Alexis defended Jim. "We made a mutual agreement not to discuss our past relationships … We had both been married before, and we both had pasts, so instead of dwelling on the past, we focused on the future … our future together," Alexis wrote in her official Bravo TV blog. "I never asked Jim if [he and Tanous] dated, and he never told me. He definitely should have told me once Peggy and I started to become good friends." She went on to say she was "hurt and angry at Jim" once the truth was revealed, but she wasn't going to let it affect her marriage. Was he already looking for a new housewife? One week after Jim filed to end their marriage, the couple released a joint statement in an effort to hush all of the speculation running rampant. "Outside of the news of our decision to part ways, there is nothing provocative, alluring, or sordid about the dissolution of our marriage," their statement read (via Us Weekly). Oh, but if only that were true! Less than a month after slamming Alexis with divorce papers, Jim was photographed in Las Vegas kissing a mystery woman! He moves on fast, doesn't he? When he was confronted by RadarOnline about his Sin City tryst, he responded, "Alexis and I each spent 2 1/2 days separately at Alisal Dude Ranch with our children. I went to Vegas and met some friends after the trip." Well, that doesn't sound like a denial at all! Since he listed "TBD" as their date of separation on the divorce paperwork, there's no telling when this new woman entered the picture or if she's the catalyst for their divorce. Days after Jim filed for divorce, Alexis didn't hide out from the world and stay cooped up in her $4 million mansion. Instead, she packed her bags and her three kiddos and headed out on a fun-filled vacation to Montana…sans Jim, obviously. She posed for a photo at the airport with her children and a huge smile plastered on her face. Her cheesy grin almost made us forget all of those ugly divorce rumors. Almost. On July 9, 2018, Alexis put on a brave face and headed out once again. This time, she attended a wedding with a supportive male friend as her date. She posted a photo looking all snazzy in her little black dress (left), along with a caption that read, "Although no one can go back and make a brand new start, anyone can start from now and make a brand new ending." Amen!